This past Monday night, me and two friends – let’s call them Harvey and Wayne – hung out at my place and streamed Jeff Who Lives at Home. We all enjoyed it. Harvey mentioned something about how he had been meaning to watch Adaptation for a long time, but had never gotten around to buying it. Since I own the DVD, I lent it to him instead. I then let my eyes wander over my DVD shelves to scan for more stuff he might like. I knew he’s interested in the way people talk and interact with one another, so I picked out Roger Dodger for him – a movie all about a cynic trying to teach his nephew how to pick up women. Last night, Harvey wrote on my Facebook wall about how much he had enjoyed all three films. Three films in three days that he in one way or another saw through me. It was very gratifying. A real spirit-booster, in fact. I was happy for him having seen great films, of course, but there was more to it than that. After thinking about it a while, it hit me just why this made me so glad. It’s the one way my love of film benefits others. Think about it. Many hobbies or pastimes can be applied for the purpose of helping people. My brother, for instance, is into computer stuff. Whenever our parents have some problem with their computers or router or something, they call him. His computer hobby is thus beneficial. Another friend of mine loves to tinker with cars, so he’s the one to talk to if one has automobile trouble. Others love pumping weights at the gym; they’re way more useful than I am when you need help moving. As far as hobbies go, being into movies is something that doesn’t offer much to others. Through these three films, however, I served three different helpful roles: Scout, Curator, and Oracle. SCOUT. We movie-lovers are always on the look-out for new things to see. We forge ahead into the unknown, keeping our eyes and ears open to find out what’s going to hit theaters in the future, what new projects have been green-lit, and what underappreciated gems have just hit Netflix or the DVD and Blu-ray market. 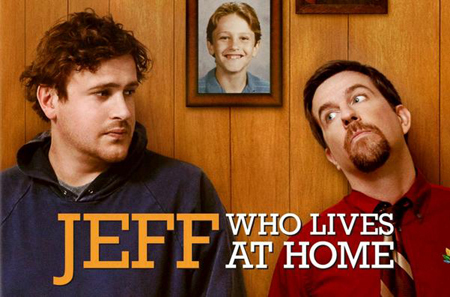 Plenty of my fellow online film fanatics had had good things to say about Jeff Who Lives at Home, so it had been on my radar for a while. Flipping through Netflix trying to find something for us to watch, I highlighted that film and said I had heard good things about it. Bam, settled! We hit play. As a Scout, I had spotted that film. And it was good, said Harvey. CURATOR. I may only have been into movies in a big way for 5 years, but in that time span, I have collected a fair amount of films on DVD and Blu-ray. Sometimes I worry that I’m collecting for the sake of filling out my shelves, but that’s not really the case. The reason I buy movies is so that I know they will be available if there is a need for them. Whenever I get the urge to see Lost in Translation, I need to have it at my beckoning. I don’t want to have to rely on Netflix to have it available on that particular month, or worry about the local rental store having gone out of business. I have movies available for my own needs, but also for others. If someone knows a film they want to see, I might have it and can lend it to them. If someone gets the idea to fill in some gaps on the IMDB Top 250 list, I can help them out by letting them borrow DVDs from me. As a Curator, I had put Adaptation in my collection so that Harvey could borrow it. And it was good, said Harvey. ORACLE. Assuming this role is to dabble with the art of film recommendations. Strictly from the viewpoint as a movie fan, this is the most difficult role we serve as, because it requires knowledge not tied to movies: knowledge of what the person we’re recommending to likes and dislikes. What goes into a succesful movie recommendation could fill an entire blog post of its own, but suffice to say that it’s a tricky business. We do what we can with the information available to us. As an Oracle, I predicted that Roger Dodger would be to my friend’s liking. And it was good, said Harvey. We don’t always fully succeed in playing these roles, of course. That Monday night I performed further tasks as an Oracle, for instance, and the results are still up in the air. To Harvey, I recommended and lent ensemble dramedy Beautiful Girls, on the basis of it having a similar feel to other films I know he likes. I don’t think he has watched it yet. To the other friend, Wayne, both me and Harvey recommended Before Sunrise. This is a risky pick as romance isn’t his preferred genre, but one of the key elements he enjoys in film is dialogue, and there’s certainly plenty of that in Before Sunrise. I also lent him Jack Goes Boating, which he had been meaning to see for some time – here I put on my Curator hat again – and Being John Malkovich, which was a combination of “not having seen but should have” and “you’re gonna dig it”. We can fill two roles at the same time occasionally. Hopefully, both Harvey and Wayne like all the films they went home with. If they do, I’ll be at least as happy as them. I’ll be happy about having leveraged my “selfish” hobby into being of benefit to others, and happy about having done a good job in my roles. Posted by Emil on 10 January, 2013 in Misc. It is a great thing when you can do that. A colleague of mine would drop by regularly for suggestions and he almost always what I suggested.